Our leading mailroom furniture and mailroom supplies are manufactured using hard-wearing and robust materials - and are built to last. All our postal furniture is manufactured in the UK using premium materials and assembled at our factory in Kent. 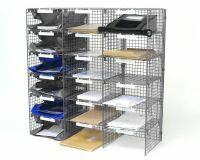 We design our furniture for mailroom needs, with items such as our Mailsort Frames, which are easily adjustable and can have additional columns added for extra capacity. 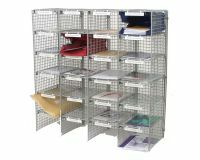 We also supply a complete range of equipment for the mailroom, from postal trolleys to sackholders and mailsacks. Our experience in the mail industry and with mailroom supplies is second to none, with The Royal Mail and the U.S Post Office forming an integral part of our early client base – relationships that have remained strong for over forty years and counting. 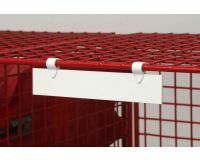 Including our extensive range of postal and mailroom furniture on offer, we also create made-to-order bags to the exact requirements of customers. For more information on our mailroom furniture, or to find out more about our mailroom supplies, please contact us or browse our extensive range.